Celtic could miss out on winger Patrick Roberts, with the £6.75m-rated wideman reportedly a target for teams in France and Spain. Bordeaux, Rennes, Saint Etienne and Girona are all keen on the 21-year-old, who hit 18 goals in 78 games for Celtic while on loan from Manchester City, adding 26 assists. Steven Naismith faces an anxious wait to learn if he will be hauled before Hampden beaks for his stamp on Celtic winger Jonny Hayes. Sevilla look increasingly likely to secure the services of Celtic’s Dedryck Boyata, with Los Hispalenses believing they won’t have to pay the £10 million price tag the Hoops have placed on the Belgian defender. 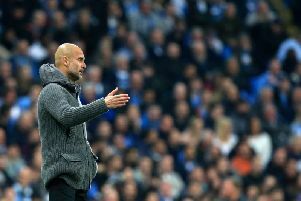 It emerged over the weekend that the Spaniards had earmarked the former Manchester City kid as a potential signing as they look to bolster their backline. Aberdeen are close to sealing a loan deal for Manchester United striker James Wilson. Described as ‘one of the brightest young English prospects’ by ex-United boss Louis van Gaal, the 22-year-old underwent a medical with the Dons over the weekend. Steven Gerrard has warned his Rangers players to improve their discipline after seeing his team reduced to 10 men for the second consecutive week in the Scottish Premiership. Ross McCrorie was shown a straight red card for a foul on St Mirren striker Nicolai Brock-Madsen but Gerrard had no issues with referee Don Robertson’s decision. Hearts expect to be without captain Christophe Berra for several games due to a hamstring injury sustained in Saturday’s 1-0 win against Celtic. The 33-year-old was stretchered off near the end of the first half after falling inside his own penalty area. His leg was placed in a brace and he was given crutches as a precaution. Berra will likely miss the games against Dunfermline in the Betfred Cup and Kilmarnock in the league. Hibs have been linked with a loan move for Nottingham Forest striker Zach Clough, with Aberdeen also reportedly interested in the 23-year-old. Neil Lennon, who bolstered his squad with the acquisition of winger Daryl Horgan on a three-year deal from Preston over the weekend, is keen to supplement his squad with further additions.